Yes, that’s right. Another Cronenberg movie. Though I suppose Dead Ringers is a natural conclusion to the string of films directed by David Cronenberg that we’ve reviewed. Because even though I already professed to being far from an expert on the director’s work, from what I can tell, this is about the point where Cronenberg started to stray from the horror genre entirely. And at this point, it’s probably safe to say that he doesn’t seem intent on returning to the genre he made his name on any time soon. I suppose I’ll start this review out by pointing out a weird fun fact, or rather a string of coincidences that kind of tie together. Namely, that Dead Ringers is based on a novel by Barri Wood and Jack Geasland, called Twins. Though of course, they couldn’t call it Twins, since 1988 also marked the release of the immortal Danny DeVito-Arnold Schwarzenegger vehicle. Which, oddly enough was directed by Ivan Reitman, who as hard is it is to believe, was a contemporary of David Cronenberg’s on the 1970s Toronto films scene, and the two even founded the Toronto Film Co-Op together, while Reitman served as producer on some of Cronenberg’s early films. 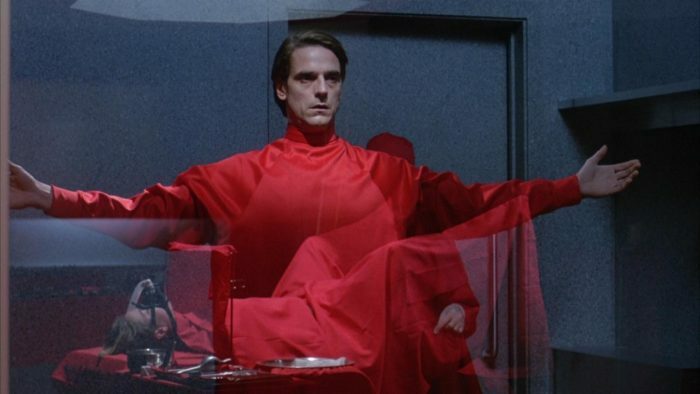 But anyways, getting back to Dead Ringers, the film stars Jeremy Irons as two twin gynecologists, one named Eliot and the other named Beverly. Also, not to get extremely off topic again, but John mentioned how Debbie Harry played a radio psychiatrist in Videodrome. Meanwhile, this film is about two esteemed brothers working in the same profession living in a fancy apartment, while one of them is the more adventurous one, and the other is a more mousy type. 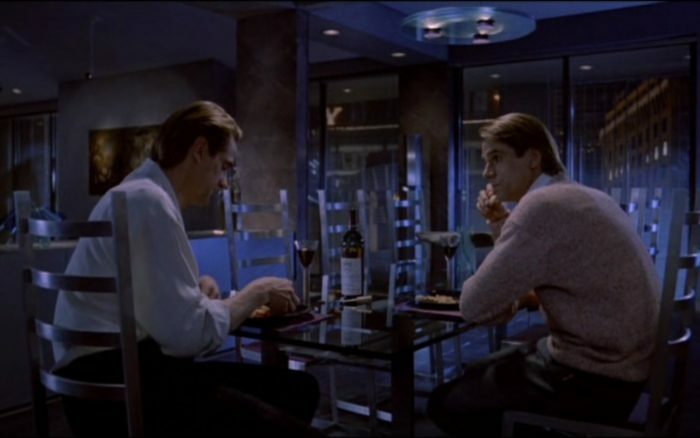 I’m just sayin’, it’s possible the creators of Frasier where Cronenberg fans. I don’t know. Just pure speculation. But anyways… (you can tell Shocktober is starting to wear on me when I can’t even get through a plot synopsis without trailing off about Frasier and Twins) Dead Ringers is essentially a movie about obsession. I think. The film begins with a series of vignettes, showing Eliot and Beverly’s accomplishments in the gynecological profession through the years. Then, in present day, we see the more reserved Beverly having relations with one of Eliot’s patients, an actress named Claire (Geneviève Bujold), because of course she assumes he’s Eliot. Both of them are enamored by the fact that Claire has a rare trifurcated cervix, which doesn’t allow her to have children. Though he originally intended her as an easy lay, Beverly begins to develop feelings for Claire, while Eliot also has a couple of trysts with her. Once Clair eventually finds out that the twin weirdos are not, in fact, the same person, she swears off both of them, which sends Beverly into a drug-induced depression, as he becomes addicted to a whole slew of different painkillers and whatnot. Then he also becomes fascinated with creating these almost H.R. Geiger-ish gynecological instruments, which are really the only objects in the whole movie that would qualify this as a horror movie. Because otherwise, this is much more of a meticulous, psychological drama. Which to be fair, was always at the backbone of Cronenberg’s work from the beginning. Since as I pointed out in The Brood, the moments in that film that worked more for me were the domestic family and cult stuff, rather than its more pulpy and supernatural elements. Here, there’s very little violence onscreen, it’s just that the constant talk of vaginas and the presence of weird metallic instruments seems to hint at a kind of sexual violence that the film puts there subconsciously, but wisely never provokes to the point of exploitation. I suppose because this is a film in which the lead actor plays two different parts, I should address whether this is done well, or feels like a gimmick. And I gotta say, Jeremy Irons is really good in this. You can pretty much always tell which brother he’s playing, just from his mannerisms, even though they’re never showy or over-the-top. After all, you do have to believe that these guys are both at different ends of the personality spectrum, but also calculated enough to belong to the medical profession. I don’t know how Irons wasn’t nominated for an Oscar, other than the possible stigma of this being a David Cronenberg movie, even though it’s one that includes very little gore or pulsating body giblets. The point is, I’m not sure I’ll ever see Reversal of Fortune, but Dead Ringers makes me perfectly ok with the fact that that man has an Oscar. Even if he didn’t get to give one to his twin brother.